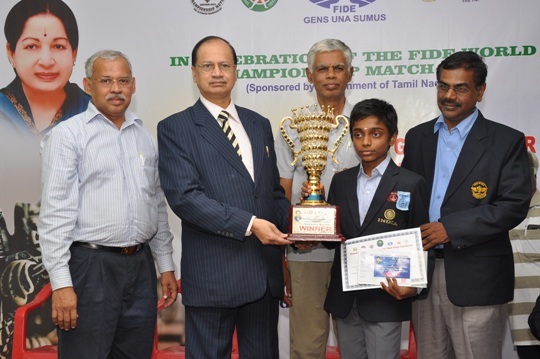 14-year-old FIDE Master V R Aravindh Chithambaram emerged the champion with a whopping 9/11 after the final round of the Chennai Grandmaster International Open Chess tournament held in celebration of the FIDE World Championship Match 2013 at Nehru Stadium, Chennai here today. Grandmasters Neverov Valeriy (Ukraine) and S P Sethuraman (India) shared the second spot with 8.5 points. Further half a point down at 8 points were GMs Vidit Santosh Gujrathi, V Vishnu Prasanna (both India) and Borovikov Vladislav (Ukraine). Borovikov, incidentally, swept off his final round Indian opponent, GM Lalith Babu, with a bolt-from-the-blue queen sacrifice. Mr.V Hariharan,General Secretary,Tamil Nadu State Chess Association, Shri. Dr.T.S.Sridhar I A S Additional Secretary/Commissioner, Revenue Administration Department, R Anantharam, International Arbiter, Champion Aravindh Chithambaram, International Arbiter M Ephrame, Chief Arbiter. Aravindh Chithambaram who already has National titles in Under 11, 13 & 19 titles under his belt, is also an Under-14 silver medalist from World Youth Chess Championship 2012 at Slovenia. His ELO 2728 performance rating here fetches 80 ELOs taking him past 2400 mark. Earlier, 15-year-old Chennai boy B Kumaran made a eleven game International Master Norm, bringing the Norms tally (2 GM Norms, 6 IM Norms, 1 WIM Norm) here to nine. This GM event, sponsored by the Government of Tamil Nadu, carries a total prize fund of 16,000 USD, including cash awards for top 35 players and cash prizes for various categories.